Official Product of American Gunsmithing Institute and Ultimate Arms Gear, Brand New. Hammer: Brass 1/2" Diameter Mallet Face Head, Heavy Duty Gunsmith Hammer-2 oz. Great to Assist With Roll Pin Punch. Wooden Handle for Excellent Balance and Grip Control. Perfect for Those Very Delicate Projects when you Must Protect the Finish of your Firearm or Other Surface. 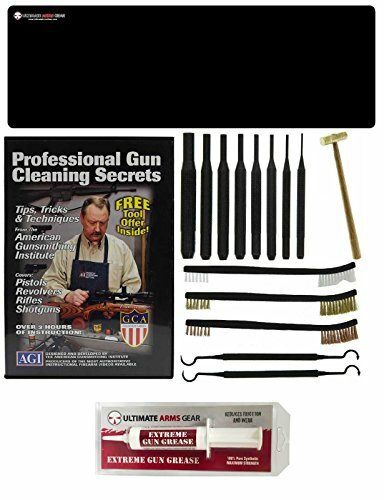 Package Includes: Gun Cleaning Mat + Professional Gun Cleaning Secrets DVD + 8 pc Punch Tool Set + Brass Hammer Head + 3pc Brush Set + 2pc Pick Set. The Ultimate Arms Gear 100% Synthetic Extreme Gun Grease will reduce friction & wear on weapons. This contains a proprietary anti wear package that is easy to use & long lasting. This will not attract dust, dirt, or sand like petroleum based products. Punch Tool: Sizes: 1/16",3/32",1/8",5/32", 3/16", 7/32, 1/4". Each Measures Approx 4" (101 mm) Long. Well Proportioned, Hardened and Properly Tempered. Manufactured to Punch Out Pins, Sights, Covers & Other Parts. DVD - Tips, Tricks & Techniques From The American Gunsmithing Institute. Master Gunsmith Gene Shuey teaches you step-by-step how to clean your guns like a Pro! Pistols, Revolvers, Shotguns and Rifles are all covered in detail. Avoid damage and protect your firearms by learning what equipment is best, types of cleaners and lubricants, when and why to use them. Plus lead removal, bore inspection, and new specialty products available to make the job easier. 5pc Kit (3 Brushes & 2 Pick Tools): Brass/Copper/Soft Nylon Bristled Brush to Prevent Scratching on Gun Parts. Brush Length: 7". Double Ended Pick Tool is Great for Scraping Dirt and Residue from Hard to Reach Places. Pick Length: 7- 1/4".The Ultimate Arms Gear 100% Synthetic Extreme Gun Grease will reduce friction & wear on weapons. This contains a proprietary anti wear package that is easy to use & long lasting. This will not attract dust, dirt, or sand like petroleum based products.